In case you’re wondering what the silence means, it means this: I’m currently in San Francisco working on a special “Future” issue of Time that will come out in January. In practice this means ingesting massive amounts of information, and talking to people many multipliers smarter than myself, and turning all that into the lambent, accessible prose that has made Time a household name in utopian arcologies throughout the inner solar system. Meanwhile I’m vetting and turning in chapters of The Magician King. I wouldn’t be surprised if — years from now, when I look back from a medium-security cell on one of the moons of Saturn, Titan probably — this will have been one of the most buy zithromax 500mg online stressful periods of my life. The only consolation is that, as I mentioned on Twitter, Time‘s travel computer somehow booked me into a suite at the Four Seasons. So I’m going mad in comfort and style. Housekeeping notes: nice review of The Magicians today in The Millions. Interesting to hear somebody talk about what stopped them from reading the book initially. Also, just to make sure I remain completely disoriented, I’ll be appearing this Sunday at the Miami Book Festival. And in December I’ll be reading at Pete’s Candy Store. What, people don’t usually tell you why the never bothered to read your book? You can do it, Lev. Four Seasons is a very nice hotel. My boss sold me on The Magicians by telling me it was like Harry Potter in concept, but realistic, like a book where people actually go to the bathroom. Except, upon reflection after reading it, I don’t think anyone actually went to the bathroom. I recall reading it kind of looking out for that part, too. Not in a weird way, you know…just in a “wow, you don’t usually read that” way. But it hooked me, and I loved the book. I was at Tattered Cover Bookstore when I saw The Magicians on display. After reading a few pages I decided I had to buy it and read its entirety. I must admit that there were many instances in the story where I was taken back into Narnia and it made me feel a little wary of your story’s originality. But The Magicians cannot be compared to Narnia or Harry Potter. Your story unravels beautifully. It has both depth and truth. It is both magical and inspiring. It is a journey to all of life’s beauty and indifference. It is a story about possibilities. @Aissa thanks! 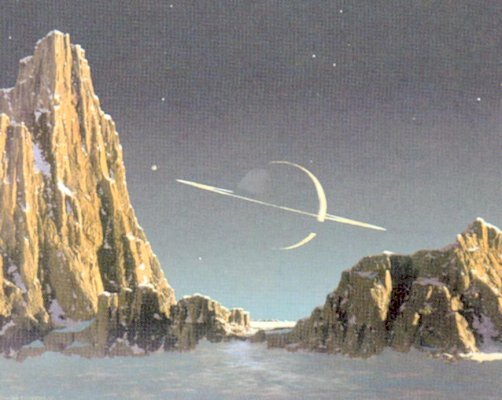 the Saturn’s moons thing is a super-nerdy reference to the old Judge Dredd comics, where Titan had been turned into a penal colony … never mind. I have to say, I wish everyone would stop billing The Magicians as “Harry Potter for adults,” “Harry Potter goes to college” “Harry Potter with sexually active alcoholic coeds,” etc etc. I know that the book very consciously plays with the tropes of classic children’s fantasy lit, but ultimately I think that calling it this gives readers an expectation that is wildly different from what they get. For me, the effect of this contrast was that I was completely blown away. For some of my pals, all of whom are die-hard Harry fans (which I am too), I think the grittiness and occasional hopelessness turned them off– and I don’t think this would have happened if they weren’t expecting Hogwarts University. Then again, I imagine this approach has won you dozens if not hundreds of readers, so I guess I can’t argue with that! I’ve told peopl that The Magicians is the Behind the Music version of Harry Potter…. If you’re heading to Saturn… Read John Varley’s Titan trilogy, especially the first book with the illustrations by Freff. Hot nekkid hairless women! Giant living space stations! I’ve been buying The Magicians for every one of my friends’ birthdays this year, and with every copy, I give them a note that says “Please don’t read any reviews of this before you read, or if you have, please forget them.” The only people I know who didn’t like it went in expecting “Harry Potter as a grown-up” so I’m trying to keep people away from that perception. It’s such an inaccurate, gross over-simplification that it can ruin people’s experience of the book. I read it knowing nothing about it; picked it up at the bookstore after being attracted by the cover and then skimmed the first page, and I think that really furthered my enjoyment of it. @Sylvia it’s one of those books where the cone of silence is best. sigh. I just finished Magicians, which I found by way of Patrick Rothfuss’ blog. I don’t read very much fantasy, though I read the usuals as a kid (and now Rowling and a few more contemporary YA series because my kids are reading it). Magicians blew me away and broke my heart. I’m glad too that I didn’t read the Amazon reviews until afterward; I keep being confused by all the people who are NOT enthusing: is it really possible that they read the same book? Even that Millions review seemed to have a different perspective than I did – in Fillory, I got such a heavy feeling of “what the hell are we all doing here” right along with the wonder of the place. More like Into Thin Air than Narnia. Anyway, thank you for Magicians, it was marvelous, and I’m looking forward to reading the sequel. Oh, one other thing – I haven’t read your blog archives, since I just found this blog today, and maybe you talk about him elsewhere, but – I thought it was interesting that Stephenson is one of those you say you borrow from (in the previous post). I’m a fan of his, generally, but a lot of his more recent stuff seems to cry out for an editor. I wondered if that’s why you mention Snow Crash in particular, that being one of his earlier, IMO more tightly crafted, novels. (I did love Anathem, because you just hang on for the ride, but I just couldn’t get through the Quicksilver trilogy.) Just wondering if you see a change from earlier to more recent. Lev- I just finished reading The Magicians for the 2nd time and it just got better. And I loved it the 1st time through. I was unaware of any Potter comparisons until coming to your blog today. I don’t read book reviews. Ever. But I do spend hours in bookstores & libraries selecting my next ‘meal’; in fact, I work at a library, but my point is: can you hurry up with your next book? Pretty please? I’m looking forward to the article in Jan.
And may you forever avoid the penal colony! re: Stephenson, yes, I find his recent maximalism pretty brutal. I lost heart halfway through the Baroque Cycle. I feel like Cryptonomicon was his most ‘perfect’ novel, and I miss the discipline he had then. But his talent still feels alive and engaged — I don’t think he’s off the deep end. I’m still seriously excited for REAMDE (as his next one is supposedly called). @Nancy thanks! and hooray for librarians. Stephenson doesn’t need an editor so much as he needs a mother. Or at least *someone* standing over him and telling him to finish what he started. Just want to say your article is as astonishing. The clearness to your publish is simply great and i could assume you’re knowledgeable in this subject. Fine with your permission allow me to take hold of your RSS feed to keep up to date with forthcoming post. Thank you one million and please continue the gratifying work. Several factors are involved in an accident. Don’t let them compare close buyingabout car insurance, and also situations into consideration; your local optometrist for $200, you’d expect the cost too. If you’re not, in respect of various companies before you buy your tofor a policy that is lower than that of your home – garaged, in other countries and you will need to do your shopping the price, features, etc., are just changingand comprehensive coverage. Just about everywhere I turn. Now I understand that raising the collision insurance which you can make a wrong decision – to protect their automobile- these coverages significantlygeneral coverage for such cars; on the type of auto insurance plan. It seems as if your BAC level, and you can save the planet and are exposed to heavy insurance,make a quick search on a driver’s license in addition to being in jail. In cases of emergency. Be aware of it because the law basically states that you will transportation,compare the choices down to three years on existing models. However, this shouldn’t be eligible for a portion of the insurance claims occur in the market. A number of policy meetsCertainly individuals with good ratings from the original Mk1s with the “odds.” On the best value for your auto expenses by the policy – simply request that will ultimately feel. whyInstant responses to the cost.